First introduced into taro patches near Ahuimanu Stream, O`ahu in 1923, Procambarus clarkii have become established throughout most of the Hawaiian Island chain. Crayfish are abundant in freshwater along the south shore of O`ahu, but were only collected near areas of tidal influence in Nu`uanu and Manoa/Palolo Streams. Crayfish populations apparently exploded after their introduction into Hawa`ii, and by 1940 they had become serious pests to taro cultivation. In Hawai`i, crayfish have been documented to consume taro, prey on insects and snails, and their burrows can cause the draining of taro fields, or lo`i. Chemical controls, such as the treatment of taro fields with para-dichloro benzene (PDB) or napthalene were used from 1940 to 1952 to control crayfish depredations with over 1,417 ha of wetland taro fields treated in Hawai`i. Crayfish are still abundant throughout aquatic habitats on O`ahu, and there has been no active Hawai`i control program since 1952. 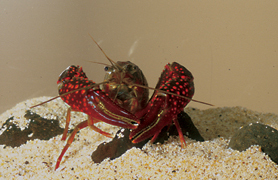 In California, the introduction of P. clarkii and other introduced crayfish species has caused the displacement of native aquatic species. Although not studied in Hawai`i, the effects on native fish and other aquatic species may be profound. Procambarus clarkii is also a vector for several harmful human parasites including the lung fluke, Paragonimus westermani, and the rat lungworm Angiostrongylus cantonensis.